In wartime England, bombs fall on London, and air raid sirens cut through the evening’s theater work. The capital city, under so much threat, keeps its glory amid tatters of buildings and scraps of courage; meanwhile, out in the provinces, an old man totters around, trying to hold together a ragtag band of misfits performing Shakespeare each night. That’s the tale of The Dresser. At the Very Little Theatre’s Stage Left, where director Reva Kaufman won this year’s counter-holiday-programming slot, the old man (Sir, played by David Wright) himself relies on his tatterdemalion crew and, most importantly, his dresser (Norman, played by popular local actor and director Michael Watkins) to get his tired body and mind onto the stage for King Lear. Watkins and Wright dive into this production and, usually with grace and intelligence, make the characters feel agonizingly, bitingly real. Sir, a toweringly privileged patriarch despite his age and his trembling hands, his naked ravings on the high street at the beginning of the play, lives and relives the acid that eats away at his heart: Why hasn’t he received the attention showered on another, much shorter, Shakespearean actor? Why isn’t he performing in London, where his home lies? Norman, who knows when to comfort, when to cajole, when to prod and when to lie, lives a knife-edge of uncertainty as well: Does Sir understand what Norman does for him? Does he appreciate it? And despite Sir’s several jabs at “nancy boys,” surely he knows that Norman’s somehow a cut above the gay actors (one of whom, arrested for solicitation, has caused a cascade of actor changes for the company’s performance of Lear). Surely. Watkins plays to heartbreaking laughs and admiration Norman’s precise fussiness, his fluttering around and setting in order the dressing room amid the sharp stings of Sir’s debauched state. A more tender Norman, one played by an actor less worldly than Watkins, might serve better for a couple of the scenes. But Watkins’ directing experience no doubt enters into his Norman’s ability to see through and nail those trying to manipulate or get some advantage from Sir. Norman has to be a lion with hangers-on and a gatekeeper for the rest of the company; he must turn a willing blind eye to Sir’s wife (Maggie Muellner)’s anger and know exactly when to head off potential complications with young females in Sir’s orbit. During the first act, I wasn’t sure about David Wright’s Sir, who spent a lot of time fulminating and blustering — so much time that each stagey moment seemed similar to the last. But when the second act began and it came time for Wright to portray both Sir and Sir playing Lear, all questions died away. Sir’s intermission breakdowns and confessions, his last-minute attempts to spur the rest of the crew to something approaching acceptable, his desperate sketch at beginning an autobiography, all reflect the stormy melancholy of a powerful personality thwarted but still pushing for success. Surrounding Wright’s performance, most of the actors portraying the inept rest of the acting company live up to that expectation of clumsiness in a way I can only hope is deliberate. Exceptions include Ron Hart as the scornful Marxist Oxenby, who despite his political leanings can’t help contributing when the play needs him (he obviously cares about the theater itself, or perhaps Shakespeare, above all) and David Kessler playing an eager yet half-inadequate Fool. Lear ends in bitterness, of course, but with some hope for the future from men like Kent, and we see the common decency of Shakespeare’s surviving characters in the middle of The Dresser. But who survives the storm of Sir’s rage against the dying of the light? Not Madge (Sharon Sless), whose life’s work crumbles around her. At least she gets a small gift out of her decades of devotion; Norman’s cup contains a far, far more bitter draught. Indeed, as the slightly punning title suggests, is he more than a piece of furniture in Sir’s conception? Tragedies work their claws into The Dresser and give a lie to the concept of important last words, towering final deeds. Though Sir gives a glorious performance as Lear, that’s not the end. Instead, the last thing Sir writes devastates one of his most devoted fans and rips to shreds their shared edifice of splendid, coruscating words. Stage Left is an intimate space, awkwardly jammed full of necessary set for this piece, but with fewer seats than the main stage. Get your tickets for the final performances now, and appreciate the interplay of Wright, Watkins and their two playwrights, Shakespeare and Ronald Harwood. 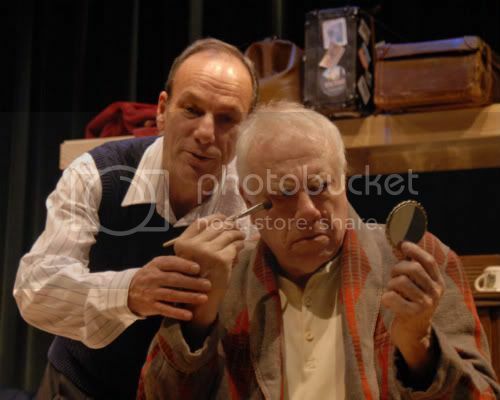 *** The Dresser runs through Dec. 13 at the VLT’s Stage Left. Tix at 344-7751.